New technologies will be employed in the planning procedures and also as innovative tools for prevention purposes. The participation of the users and the co-creation process are key elements of this new intervention model. The prevention interventions are offered by public health authorities (e.g. health care and social departments in municipalities) and address people with different health issue. 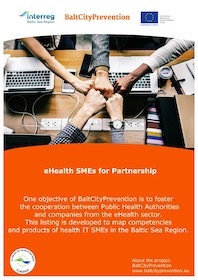 The BaltCityPrevention project aims at bringing the health IT SMEs (small and medium-sized enterprises) and public health authorities together and strengthening their collaboration. For this reason we provide a catalogue with health IT SMEs that want to collaborate with PHAs. Just click on the picture to browse the catalogue. You want to appear there as well? Contact us! Another measure to bring SMEs and PHAs together is the organization of matchmaking in different countries. If you want to participate, just subscribe to our newsletter or follow us on Twitter. BaltCityPrevention aims to develop and test a new approach which helps Public Health Authorities (PHA) in prevention intervention planning. It will enable the PHAs to better tailor the interventions to the specific needs of the user group by applying participatory and co-creation methods in the planning procedure. 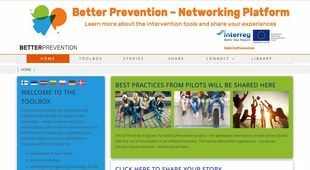 All information for the PHAs are summarized on our platform betterprevention.eu.